Fred Loya Insurance started as a single-office insurance agency in El Paso, Texas, in 1974. The agency enjoyed steady growth and, in the 1990s, the Loya family decided to expand the business by working with multiple brokers that operated under their ownership. In 2000, sensing that there was a market opportunity in the Southwest for a Hispanic-owned insurer to serve Hispanic clients, the company’s management team made the strategic decision to form their own insurance company. Fred Loya Insurance is now licensed as an auto insurance carrier in seven states and writes more than $500 million in premiums, with plans to expand sales operations. The company employs more than 5,200 people and has staff counsel operations in four different cities with a combined total of over 50 employees, including 18 staff counsel attorneys. After some initial research and internal discussion, it became clear that the only realistic way to achieve the objective assigned by the CEO was to deploy a one-stop matter management platform. There was just no way to properly automate the management of both the work product side (case files) and the business side (law firm invoicing) by a piecemeal of more than one software product. Meza’s team had a specific goal: to find a software system that would provide them with visibility into the litigation they were managing at any given time and help them implement a sound spend management initiative in partnership with their outside counsel. After narrowing down their list to three potential software products, the product search committee led by Meza viewed comprehensive demonstrations and conducted their own tests of each product. In 2006, the team selected LexisNexis CounselLink as their first matter management and e-billing system. CounselLink enables corporate legal departments to more effectively and efficiently manage their legal spend and matters, while optimizing relationships with outside counsel. Through its flexible system configuration, CounselLink can address the unique requirements of both large and small law departments, and the LexisNexis product support teams help users maximize the benefits of the system. The LexisNexis team began working closely with Meza’s team and Fred Loya’s IT department in order to ensure a smooth and easy implementation. The Fred Loya team was up and running on the system within days. CounselLink also delivers insightful reports that serve to keep everyone at Fred Loya—in both the claims and litigation departments—more accountable for their decisions. This includes routine questions about how they manage their time and more complex questions about whether to litigate or settle various types of matters. The net effect is that the company is able to oversee every nickel of their legal spend. 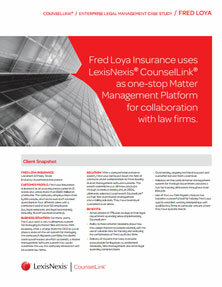 CounselLink has become the central matter management hub for Fred Loya Insurance, allowing the claims and litigation teams to track all matters throughout their lifecycle. Each matter is created in CounselLink and the system is used on a daily basis to provide deep insight into all case status (i.e., litigation) information as well as financial (i.e., law firm invoicing) information. Fred Loya Insurance is licensed as an auto insurance carrier in 12 states and writes more than $500 million in premiums. The company employs more than 5,200 people, and has its own staff counsel operations in four different cities with a combined total of over 50 employees (i.e., legal assistants and legal secretaries), including 15 staff counsel attorneys. For many years, Fred Loya used a very rudimentary system for managing its matter files and its law firm invoicing. After a charge from the CEO to put in place a state-of-the-art system for managing the company’s litigation portfolio, the claims team spearheaded an effort to identify a matter management software system that would automate the way the company interacted with its outside law firms. After a comprehensive market search, Fred Loya narrowed down the field of products under consideration to three leading matter management software systems. The search committee put all three products through extensive testing and, in 2006, ultimately selected LexisNexis® CounselLink® as their first-ever matter management and e-billing solution. They have been loyal customers ever since.